I’m usually pretty quick to dismiss the most recent efforts of guys like Jack Nicholson, Al Pacino and Robert De Niro. At this point in their careers, they phone in their performances. They’re the same character in every film. Even Clint Eastwood’s angry old man routine is getting kind of stale. 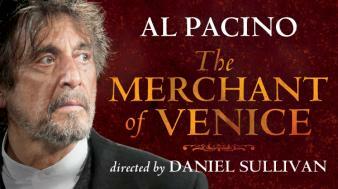 On Thursday I saw Al Pacino play Shylock in The Merchant of Venice. I’m like everybody else. I get sucked into these shows because it’s a thrill to see if a name-brand actor can deliver the goods on stage. Holy Mother of Jesus, this guy has it. I saw Pacino transform. He vanished into his role as Shylock and became a completely new, fully-formed human being—unrecognizable from anything he’s done on film. It was a pretty impressive feat. This is an emotionally complicated piece to sit through. You find yourself laughing at the comedic aspects but also watching in abject horror as Shylock is, quite unfairly, stripped of his business, his daughter and his faith by what are supposed to be the “good” Christians of Venice. (Every one of them a blatant anti-Semite, which I suppose was all the rage in 1597.) One of his punishments, none of which, it can be argued, he deserved, required that he abandon his Jewish faith and become a Christian. In one of the final scenes, a center section of the stage opens and a pool of calf-deep water rises. He is forcefully dunked three times and baptized by a priest, while his Jewish family looks on in horror. After that we all had a good laugh at the lighthearted closing scene where Portia’s husband is made to look foolish by her clever manipulations. During the trial scene, dear Lily Rabe stood her ground and gave as good as she got. An excellent Portia. The play really was just the two of them, though. The other actors were fine, but I don’t think Shakespeare fleshed out their characters very well. There was only so much they could do with the roles. Have a look at this brief clip. This is how it’s done. Al Pacino in the Shakespeare in the Park production of The Merchant of Venice. So Al didn’t scream out his lines? Seems every movie I’ve seen of his since … well I don’t know since when … he’s been a screaming actor. A bit of redemption for the old man, I suppose. pacino earned it in film… Serpico, Dog Day Afternoon and Sea of Love all stand out in my memory. There was some gangster series in there too, wasn’t there?saw awhile ago that he’ll be doing King Lear. this was, perhaps, practice? Gnu: I half expected the yelling shrew from Scent of a Woman but the advance word was that he mastered this role proved dead on.Ellie: Take a look at this brief clip. It’s controlled screaming. It’s pretty great.http://tinyurl.com/25zqzblDaisy: True, he doesn’t have to prove anything to anyone. But still. Lear should be interesting. Who plays the daughters? Sounds good! One of my favourites.And, yes, there’s a lot of anti-Semitism. Papist works could get you shivved and pushed into a river.So favouring the Court was a good way to stay alive! I’ve always had a soft spot for Al and I’ll bet it was a great performance. Unfortunately the video is temporarily out of action.Actors always borrow from each other and I wonder if he had seen Dustin’s portrayal?Dustin Hoffman asked Sir Peter Hall if he could play Shakespeare. Hall said later:”He has a quick intelligence and a superb ear. Within a few hours he was moving around in Shakespeare’s verse and making it his own. By the time he played Shylock in London, and taken it to Broadway, he was giving the finest performance of the part I have seen. It balances the tragic with the villainous, the mean with the comic, the pathetic with the predator. He was an entire and fallible man made evil by persecution.”Now Lear’s a whole new ball game. He has to carry the whole play. MIT: Honestly, there was a guy wearing a yarmulke sitting near me and I felt awful for him.Nurse: And so you shall! I believe Lear is being filmed as a movie.Pat: Hoffman would have been an interesting Shylock. I saw Sir Ian McKellen play Lear a few years ago and it was a pretty good show. Derek Jakobi is doing Lear at the Brooklyn Academy of Music early next year. I love me some “Merchant.” I always think it’s a much more complex play than people give it credit for, you know? Lucky you to see such an exciting performance. That clip actually had me transfixed.Pacino’s a legend. I’d love to see him on the stage. Well, I’d go down to Sydney to see something of this calibre. Sadly, the only “big act” to play here will be Smokie! When raunchy becomes paunchy…not good. Wait? What? That’s how the play ended? How the f*ck did I even manage to pass high school? I have no recollection of that scene even though it was a prescribed read.